Breakout 800m star Wycliffe Kinyamal and three-time World Half Marathon champion Geoffrey Kamworor were awarded, though belatedly as the April and March Sports Personalities of the month by the Sports Journalists Association of Kenya on Friday at their Kaptagat base in Uasin Gishu County. While Kamworor received his award for the month of March having clinched his third consecutive World Half Marathon title in Valencia, Spain, Kamworor was awarded having clinched a major accolade in his maiden competition with the seniors. 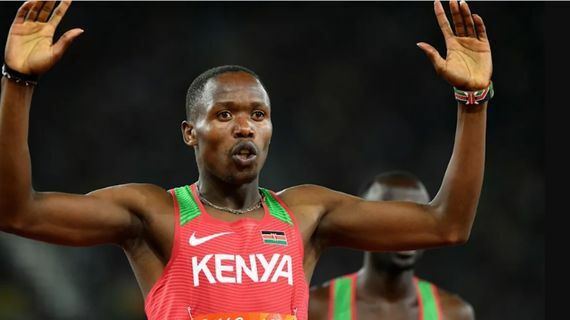 Kinyamal rocked the two lap race at the Commonwealth Games in Gold Coast, Australia in April and went on to clinch the title in the absence of world record holder David Rudisha. In claiming the award, Kinyamal beat more experienced sports personalities including celebrated volleyball star Trizah Atuka. “I am really happy to have been surprised with this award and hope it will inspire me to do more,” Kinyamal said upon receiving the accolade. Kamworor meanwhile was peerless in his run up to the March crown, wading off rally ace Carl Tundo to clinch the award following his feat in Valencia. He also beat fellow athletes Celliphine Chespol and Alfred Barkach who won the women and men senior races respectively at the 5th Africa Cross Country Championships in Chlef, Algeria. “It is such an honor to be appreciated and a good motivation as I train ahead of my races in the remainder of the year. It is always a great moment to represent my country and win. Thank you all Sports Journalists for always telling our stories, you are part of our success.” Kamworor said after receiving his award. Both Kamworor and Kinyamal who are managed by Global Sports Communication based in Kaptagat Uasin Gishu County received a 42-inch digital television set and KSh100, 000 courtesy of sponsors StarTimes.